So, the 10th Anniversary Event is going away today. I didn’t get everything I wanted from it, and it was a dreadfully long and painful raid for one guaranteed helm (and a mount on your first victory of course). Despite that, I consider it a successful anniversary. If they had nerfed it, it would not have conveyed the epic feeling of the original. It needed to be something that required some dedication and desire. Everyone got a Molten Corgi just for logging in. However, a bit higher drop rate on the pet and enchant would not have hurt anything. Sure, I only ran it a half dozen times or so, but figure 3 to 4 hours for each run and that turns into one full day spent in Molten Core. Apparently last week when it was extended for an extra week, that was enough to motivate me to gear up the two alts I have at 100. Junahu was first, then Sanbec followed over the weekend. 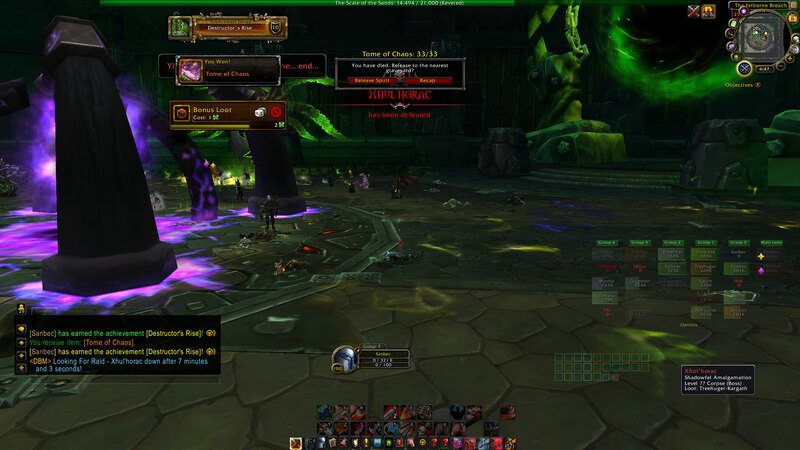 I also ran both of them through LFR Highmaul. Juna was lucky with gear drops, San only got a ring. San also spent a good part of nearly every fight watching from the floor. 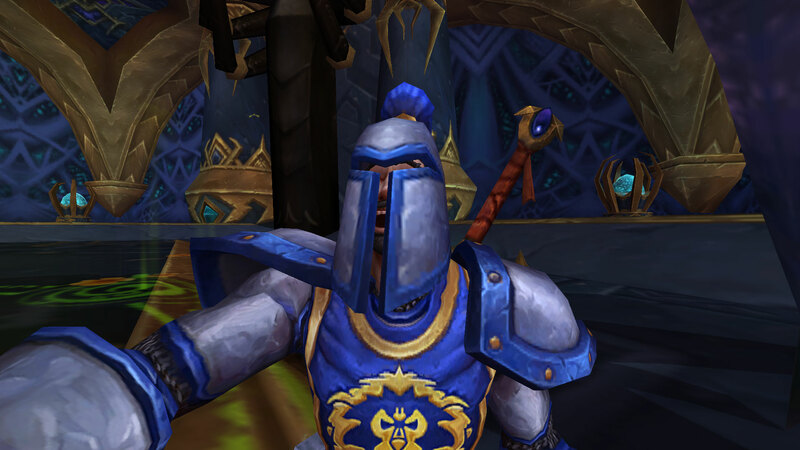 It’s not that I’m not used to melee considering my ‘main’ is a ret pally. I guess I just never quite realized how much I depend on sacred shield and word of glory to manage my health bar, not to mention divine protection which has a relatively short cooldown. And then there are divine shield or lay on hands in extreme cases. What does my warrior get? Die by the Sword on a long cooldown? That’s it? Really?? Oh, right, and pending victory or whatever every 30 seconds. And a healthstone. Now that I have those two ready to lolraid, I’m not sure what I will do next. I have a project in the works on Alliance side which requires a fair bit of gold, so I’ve been playing there a lot more, so maybe it’s time to play with Kerick again. San got an upgraded quest reward in Nagrand that replaced his Garrosh heirloom, so it got passed down to Kerick. I just need a chunk of playtime long enough to get him through the jungle and get his garrison set up. 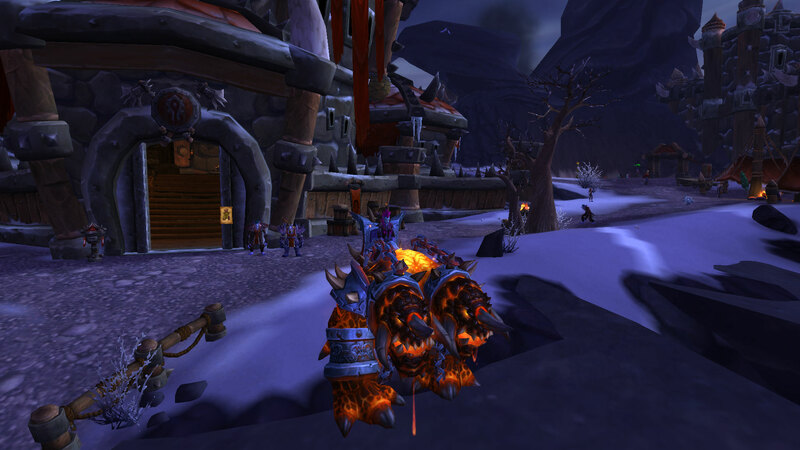 I am almost at the 200 mounts mark. Thanks to my friend Shudal, I am now one closer. All I had left for the 25 man Ulduar drake was the Flame Leviathan achievement. Yeah, the vehicle fight. If it was something where I could just go slice something up with my sword, I’d have been done long ago. Sure, I’ve been told it was soloable and given advice on how to do it but I just couldn’t hack it on my own. So he invited me along when he went to collect shards and we got it done. I still like the 10 man rusted version better (which I got at the end of Wrath or very beginning of Cata) but hey … it’s one more I can check off. 198 down, 2 to go! 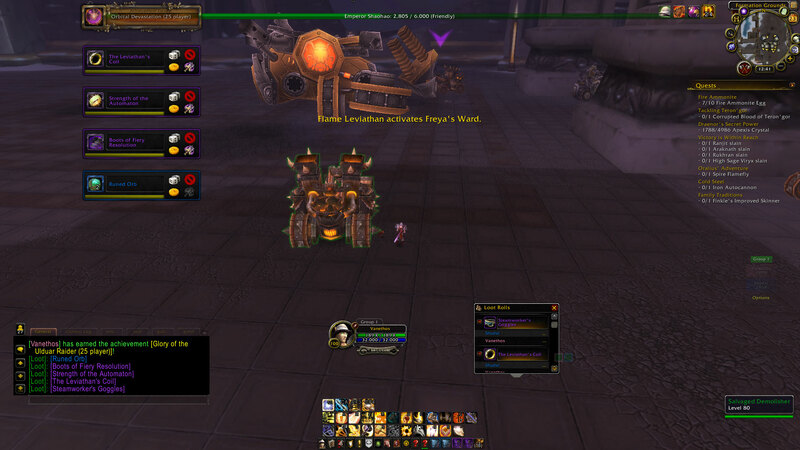 So, I dunno what the deal is with the queue for plate wearing dps to get into the Molten Core LFR. Over the weekend I spent well over an hour in queue several times without ever getting in, while a guildy would queue up on a non-plate character and get in within 10 minutes or less. Two other plate-bearing guildmates were also complaining about sitting in queue forever without it ever popping. Last night though, I queued up right away after sending my followers out on missions, and before I could figure out how to beat the pets visiting my menagerie, the queue popped. I almost fell out of my chair. Wuhhhhhh? I mean, I seriously was not expecting it. I had heard plenty of horror stories in guild chat about how horrible it was. I know from experience that LFR itself can be all sorts of frustration. I also know, however, that it can be a hilariously good time. It just depends on the group you get. This group, fortunately, fell on the fun side. We cleared up to Baron Geddon with little to no difficulty. There was laughter and joking about dps = dispels per second. 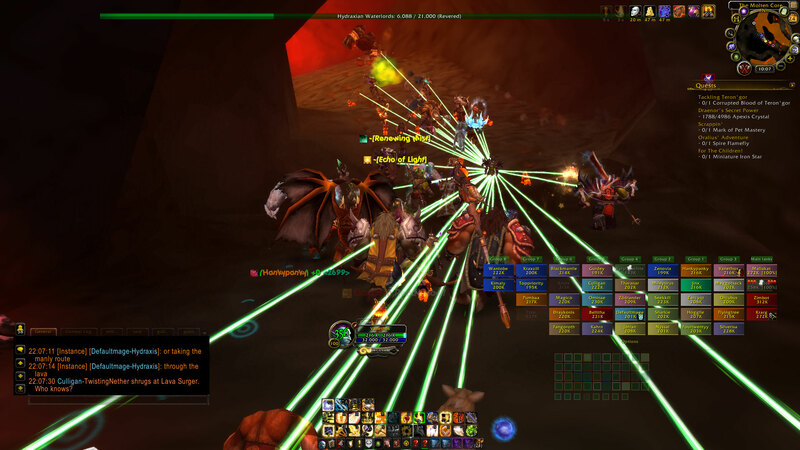 There were comments that we would surely wipe unless everyone had their molten corgi out, so of course, we had a virtual army of fiery little dogs dragging their butts through the raid. Things did go a bit sideways once we passed through the tunnel to the Baron’s area, though. Once we managed to clear trash without pulling the boss at the same time, however, we got through it alright. Until we got to the next little bridge with the pack on the other side and the core hound that patrols. Eventually we managed to get everyone to hang back while the tank waited for the dog to pat away, ran halfway across the bridge, tossed his shield into the pack, and drew them all to our side of the bridge. The rest after that, as someone in raid chat pointed out, was cake. One of the other paladins had some toy that puts a beam between himself and another player. So of course, he put one on every single person in the raid. It made for quite the light show as we traveled to Rag’s chamber. And then we were there. I gotta admit, Rag’s speech seemed a lot more impressive with 39 other people there, compared to when I solo the original version. 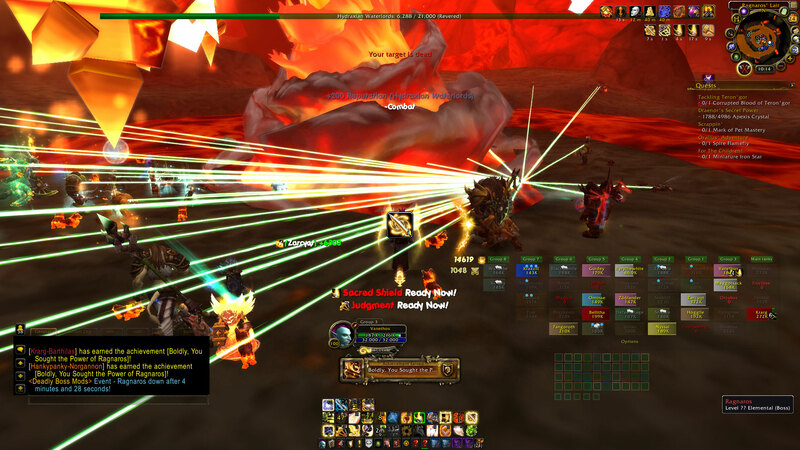 At one point, the fight paused, and I thought it was over until all of these sons of flame came out. Wait, what? I had never fought him at the original intended level, I had always been there on a higher level character and killed him before he summoned adds, so I totally forgot that even happened. 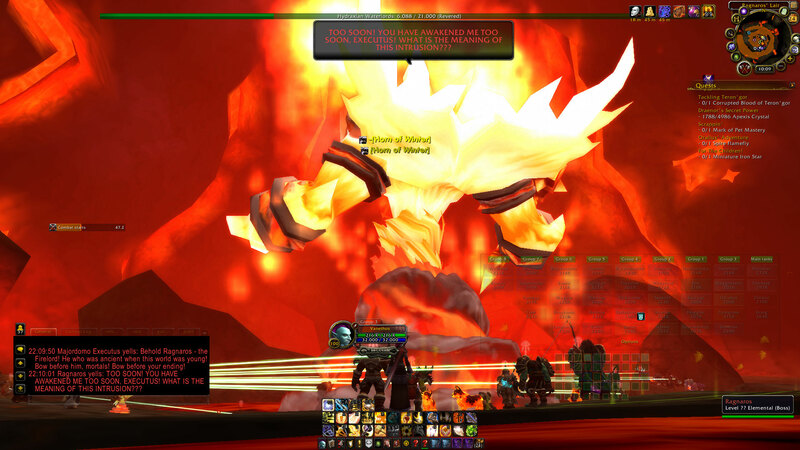 I mean, I should have known, given all the time we had spent working on him in Firelands, but I just didn’t make the connection until it actually happened. Soon, though, he really was down. 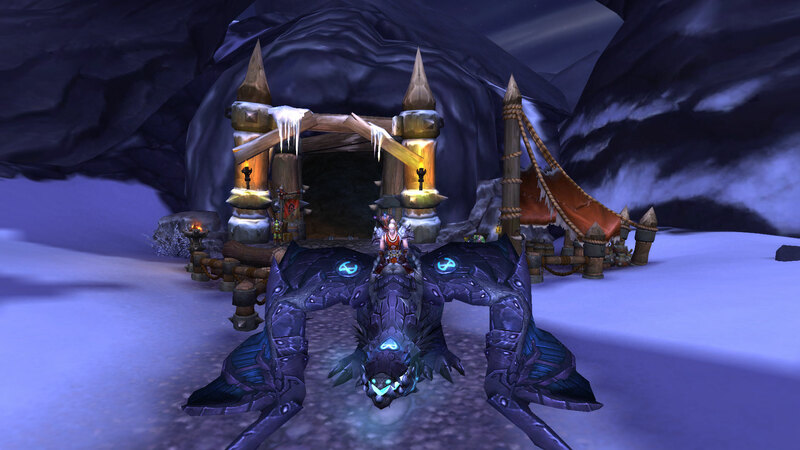 I didn’t get the pet, but I was happy with my new helm and mount. Maybe I’ll go back again to try for the pet.